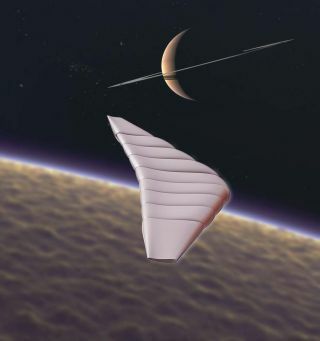 An artist's impression of a winged vehicle entering the atmosphere of Saturn's moon Titan. As the long-running Cassini mission enters its last year at Saturn, NASA is moving forward with an early-stage technology study to send a drone to its moon Titan. The agency awarded a Small Business Innovation Research (SBIR) Phase 1 contract for Global Aerospace Corp. and Northrop Grumman Aerospace Systems to create a vehicle known as the Titan Winged Aerobot built to explore Saturn's largest moon and prepare a prototype for testing on Earth. SBIR Phase 1 contracts last six months and are worth up to $125,000, according to NASA. The new Titan robot will include several design elements to let it cope with that environment, he added in the statement. This would include excellent "lift" generation (the ability to soar using Titan's dense atmosphere), maneuverability and the ability to withstand Titan's atmospheric pressure. Titan is the only known solar system moon to have a substantial atmosphere and a liquid cycle (including hydrocarbon lakes on its surface), which has led some scientists to compare it to an early Earth. It also could host methane-based life despite its harsh temperatures (minus 300 Fahrenheit, or minus 184 Celsius, at the surface) and lack of water, which earthly creatures require. Titan has already seen one landing. In 2005, the Cassini mission sent the Huygens probe to the surface of Titan. It remained operational for a couple of hours, sending back data on the moon's atmosphere and surface. Unlike Huygens' single landing, a Titan drone could soar above many locations. Because it is closer to the surface, it could map Titan in greater detail than the higher-ranging Cassini flybys. This provides potential for studies in astrobiology and habitability, Global representatives said. The design calls for a maneuverable glider, as well as atmospheric entry and ballooning capabilities, that can be controlled in 3D. It would operate using a single nuclear-power source, which is common for missions far out in the solar system that don't receive a lot of sunlight. One unique feature of the Titan Winged Aerobot is a buoyancy system that would let it ascend and descend without need of propulsion or traditional aviation "control" surfaces such as flaps, Global representatives said. The robot could fly over sites several times and even send targeted probes down to the surface, the company added. While the technology is designed for Titan, Global said the glider's work could be used on "any solar system body with an atmosphere." Applications could include returning payloads to Earth from the International Space Station or viewing Mars from a drone built for its thin atmosphere. The SBIR program is part of a suite of NASA programs that fund far-out research. The research looks at aerospace or space technology concepts that could be decades away from flight, if they're selected for further development.